Pouring Guinness® is different from dispensing your standard carbonated beer. 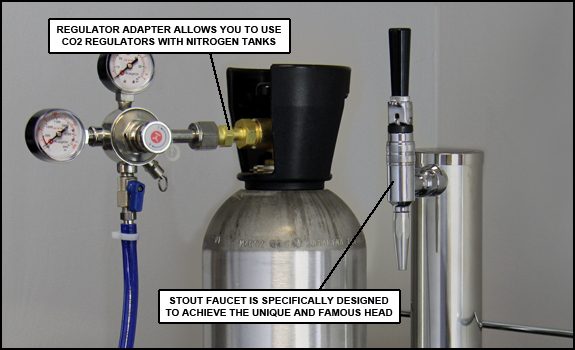 The key differences to a Guinness® dispensing conversion kit as opposed to our standard kits are the specialty faucet, the Guinness® dispensing coupler, and the mixed gas high pressure tank. Guinness® requires a specialty faucet with a restrictor spout to achieve the proper head. To properly tap a Guinness® keg, you will need a European "U" system keg coupler. Nitrogen tanks have a CGA-580 valve as opposed to the standard CGA-320 valve found on a CO2 tank, making them incompatible with regulators that are designed to dispense carbonated beer. This Premium Guinness® Essentials Kit includes a stainless steel stout faucet, an ergonomic squeeze handle keg coupler and a CO2 regulator to nitrogen tank adapter which will allow you to use your existing regulator instead of purchasing an expensive nitrogen regulator separately. Simply switch out the faucet and coupler on your existing system and install the adapter on your regulator and you are ready to go! This is a great non-permanent solution that allows you to switch back and forth from carbonated to nitrogenated beers easily. The most complex part of dispensing Guinness® is getting a mixed gas high pressure tank that a local gas supplier will be willing to fill. You can either rent your tank locally or you can buy our high quality tank once you confirm that you can fill it with a mixed blend locally first.